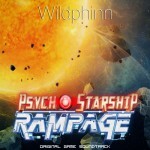 Wildphinn » Psycho Starship Rampage on sale on Steam: get 50% off! What a rainy spring. Looking for something to keep you hooked for hours on end? Psycho Starship Rampage is on sale now, and for a few days only, at 50% off!